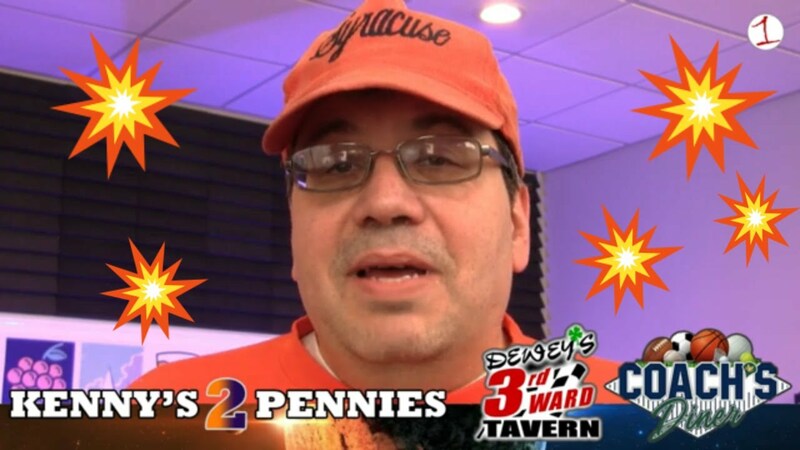 On this week’s episode of Kenny’s 2 Pennies brought to you by Dewey’s Third Ward Tavern & Coache’s Diner in downtown Waterloo Kenny talks Syracuse basketball and gives his opinion on the resignation of longtime girls head basketball coach Damon Nicholson. The brackets are set for the 2015 Section V basketball championships and we break down the chances for all the Wayne-Finger Lakes teams to get to the Blue Cross Arena and capture a sectional title. Also, we reveal our All-Wayne-Finger Lakes coaches and players of the year. Mike O’Brien of Waterloo is in-studio to talk about the Final Four with the Dog and Damon Nicholson, head coach of the state champion Romulus Lady Warriors girls basketball team, calls-in to the show as the team is on a bus headed to Albany for a special lunch with Senator Mike Nozzolio.